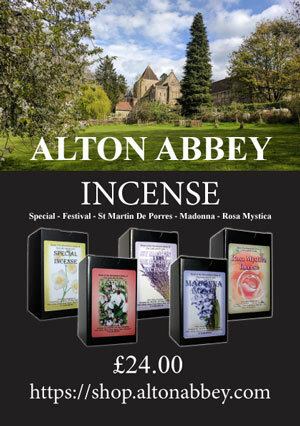 You can be read in full here: https://educationpriest.wordpress.com/2018/03/18/alton-abbey-incense-a-review/ - March 18 2018. "You will notice that I have a very limited vocabulary for describing aromas – for which apologies. Despite its name this one, for me, has a broad sort of smell that gives it an everyday quality, it doesn’t remind me of too much." "This has a nice astringent, cleansing sort of smell about it. A bit like a decent toilet cleaner (I like that). (Evesham from Mucknell Abbey has a similar quality in my view)." "Very floral, but with a sort of depth to it and a richness, it lingers very well. It smells as I imagine the spices at the tomb (foreshadowed by the frankincense brought by the magi), so it’s a good one for both Christmas (inc Epiphany etc) and Easter." "More floral than Special, but not so talcum like as Madonna or Rosa Mystica, this definitely suggests a greater degree of celebration without going over the top. I might prefer a separation between aromas for Feasts and Solemnities, so perhaps Alton will introduce something else? Or perhaps I could be slightly treacherous and suggest Basilica from Prinknash, this was used in my childhood churches and immediately takes me back to being a boat boy even before I started school." "This definitely (for me) has the smell of talcum powder – as my gran used to have. Very distinct, I wouldn’t want to use it every day or even for a season, but because it is so distinct it stands out even in a season when other highly perfumed incense is used."